Joe Ward (white shirt) should be back for Posh at Blackpool. 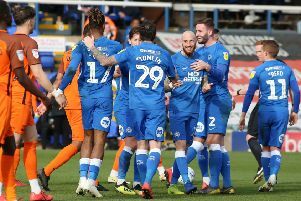 Peterborough United expect to welcome Joe Ward and Ben White back into the first-team squad for the tough League One trip to Blackpool on Saturday (April 13). 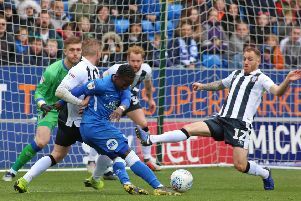 Winger Ward missed Saturday’s 2-0 win over Gillingham because of a family illness and on-loan centre-back White was absent because of an ankle injury. Matty Stevens (left) and Matt Godden. Prolific reserve team goalscorer Matty Stevens is expected to again sit on the substitutes’ bench. He scored his 23rd goal of the season in a 5-2 defeat at Forest Green today (April 9). Morgan Penfold also scored for an inexperienced Posh team. “Matty has done all that’s been asked of him,” Ferguson admitted. “But he just has to stay patient as if we keep playing with the current system he has to get past two very good players in Ivan Toney and Matt Godden. Stevens (21) signed a contract extension earlier this year keeping him at Posh until 2021. His presence on the Posh substitutes’ bench every week satisfies the Football League rule of one homegrown player in a matchday squad.